The City has two parks. One is located at the Dam and is currently closed due to flooding in 2016. The area around the dam suffered severe erosion due to the high water level. Please be wise and know that the area at this park is not safe. 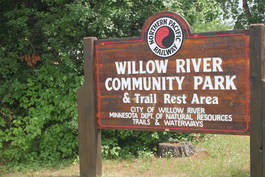 The other park is located along the Willard Munger Trail. We are proud of our K-12 school! Website. The campground is run by the State of MN and has 38 campsites. Click here for more information and rates. Close to the Willard Munger Trail which is a collection of multiple use trails between Hinckley and Duluth. The General C.C. Andrews State Forest Trails consists of 24 miles of trails that meander through this state forest.